this was my final project for my typography course at uni - to create an autobiographical poster using typography. 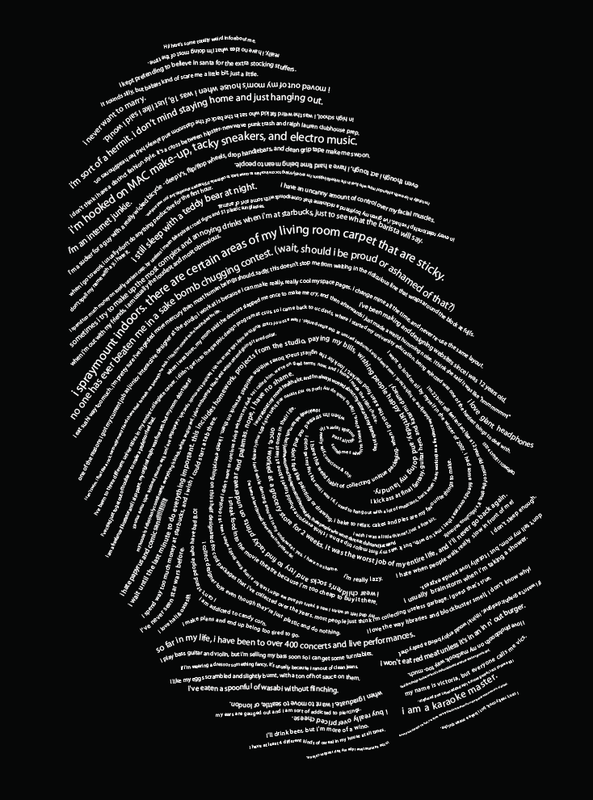 i chose a fingerprint because each person has his or her own unique pattern, and i constructed the lines out of type. all the info about me is true, but the secrets and more private things about me are more difficult to discern and closer towards the centre of the spiral. the type family used is avant garde. and omg I SOO brainstorm when i'm in the shower too, all the time! This is beautiful. It's so rare to see a really great concept. oh wow, vicki this is really neat. i love the idea....great job! I... will beat you in a sake bomb chugging contest. Wait for it.